Spy Publishing Partners’ old “Separated At Birth?” feature, consisting of two unrelated celebrities put side-by-side to point out likenesses, was a lighthearted goof that used to appear in print media, back in the bygone days when words used to get printed onto paper. 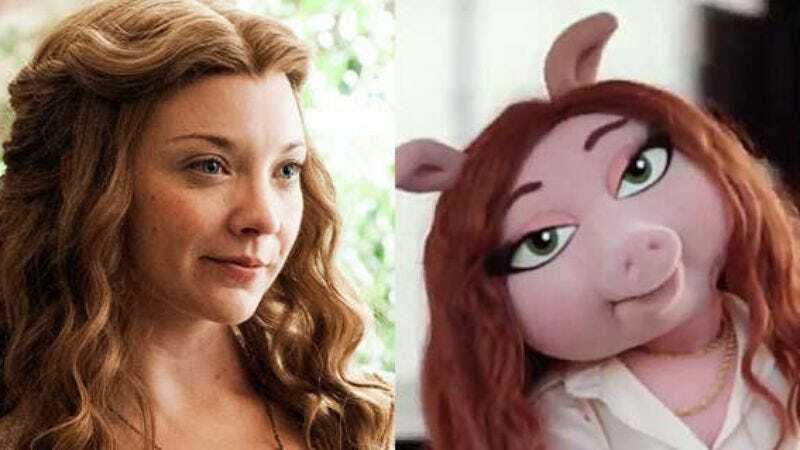 It seems a few people have been doing their own version of that lately, with Game Of Thrones’ Natalie Dormer and the new love interest for Kermit The Frog on ABC’s The Muppets, a character accurately named Denise The Pig. Happily, Dormer isn’t thrown by the comparison—according to Entertainment Weekly, she thinks she may have brought it on herself. There’s a scene in season 3 where I’m walking on all the cliffs with Sansa, and I’m telling her how I was teased as a young girl for my nose. I asked in a dinner with David [Benioff] and Dan [Weiss], ‘Please, can you put in a line about a pig nose?’ I was bullied at school, I used to get told I had pig nostrils. I said for my own demons, it would be sticking two middle fingers up to the bullies of my childhood. If you watch the DVDs, you’ll see me oinking backstage. When I saw that Kermit had a new girlfriend, I thought I might be responsible for that. I brought up the pig subject myself. So, you see, she’s not offended, because she already processed any possible jokes about her pig-like nose through a tossed-off line on her hit show. And Muppet-style pigs are adorable, so there’s also that. Oh, and being named one of GQ’s Hottest Women In Culture 2014 might help mitigate the pain of that whole “ugly pig-nose” taunt from her childhood. Not to endorse arguably sexist body-image standards, but Natalie Dormer isn’t too worried about being compared to an anthropomorphized pig. Besides, everyone knows frat boys have cornered the market on being human pigs.